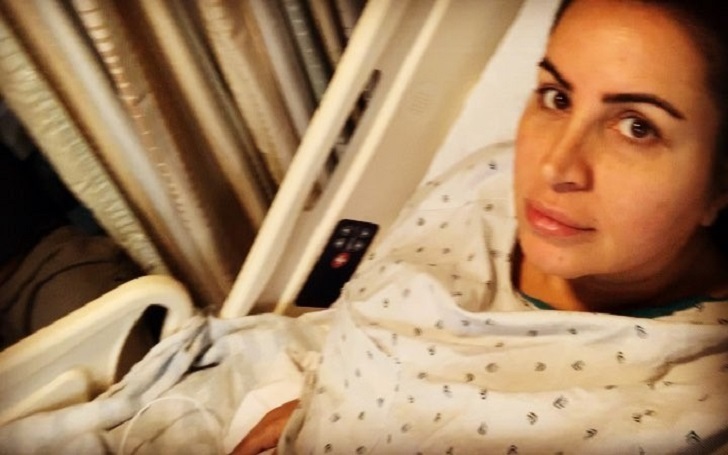 Pregnant Mercedes Javid spent a whole night in the hospital for cervical cerclage surgery in December and the Shahs of Sunset star just shared video clips from the maternity ward she was admitted to at the time. The television personality, 46, took to Instagram on Sunday, February 20, and posted the footages from the hospital bed. She said in the first clip, "We had a little situation with my cervix measuring too small, and now we’re monitoring it." It’s been a pretty uneventful pregnancy until this week and now we’re just feeling like we’re in pretty good hands. It’s gonna be bed rest for awhile. This little vid was taken after xmas, moments before my exceptionally incredible doctor … performed this little surgery called a cervical cerclage. You get an epidural, and a stitch, which [is] considered a rescue. Bedrest [sic] is far from the ideal way to spend these beautiful days, but I’m learning a lot during this quiet period. … The procedure is painless and under an hour. As we previously reported, a source reported on October 5 that the actress confirmed her pregnancy to the cast of the Bravo hit series during a reunion on October 4. Days later, the Bravo star confirmed to E! News that she and her husband Tommy Feight had a gender reveal party where they found that they were expecting a baby boy together. The upcoming child is first for both of them. The couple became married on April 21, 2018, in a lavish wedding ceremony at the Jeremy West Hollywood. The parents-to-be exchanged the vows in front of gorgeous flower arrangements that were designed by Craftsy’s Carly Cylinder.